You’ve probably heard of fatwood, the miracle fire starter. “Miracle” might be a bit strong, but fatwood makes wonderful tinder and kindling. Finding and harvesting fatwood is easy. Here’s how. 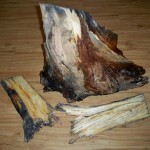 Fatwood is dried wood that is full of resin. In fact, you could even say that fatwood is “heavily impregnated” with resin or pitch, hardened to the point that it almost seems petrified. You find fatwood in the stumps of dead pine trees. 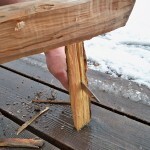 More specifically, when a pine tree dies — especially from getting cut down or broken off — all of the resin in the roots gets drawn into the stump, right above the tap root. 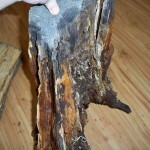 The stump becomes saturated with resin. As the roots and trunk rot away, the resin-soaked wood at core of the stump hardens and endures. The resin itself contains terpene, the main component of turpentine. It is incredibly flammable. It takes flame effortlessly and doesn’t want to give it up. Because of this, fatwood shavings can be lit with a spark, even when wet, producing a flame that resists the wind and burns much, much hotter than regular shavings. Fatwood shavings make a wonderful tinder that will easily set blaze to larger pieces of kindling. Where Can I Find Fatwood? You can buy fatwood online in everything from 10 lb boxes to massive 35 lb boxes to clever little emergency fire-starter tins that come with fatwood sticks, jute tinder, and a ferro rod. In every case, the fatwood comes split into small, uniform-sized sticks ready to be shaved or lit, and it makes an excellent fire starter. For some folks, buying it is the easiest way to start enjoying it. For me, though, finding and harvesting your own fatwood lends that extra bit of satisfaction to your fires, that extra nod that every part of your fire came from your own skills and efforts. Fatwood is easier to find than you’d think. All you really need to do is find a stand of pine trees. You’ll find a fatwood bounty in logging areas. Once you’ve found one, look for old, dry stumps. Ideally, you want stumps that are gray and rotting. Rotting stumps have had plenty of time for the resin to collect in the stump. Fresh stumps will be poor in fatwood. I found a beautiful stump of fatwood behind a cabin. Some pine trees had been cleared for use in the cabin, and now that a few years had passed the cores of the stumps were hard with fatwood. One stump in particular, pictured below, had rotted so much I could pull it right off of its roots. The wood around the perimeter was so rotten I could break it off with my fingers. But the veins in the core of the stump were almost petrified. This is the fatwood. The highest concentration of fatwood will be right at the top of the tap root, that intersection between roots and trunk. In some cases, you might have to burrow down through the stump until you hit that section. 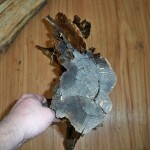 If there’s fatwood, it will feel like a rock compared to the rotting stump. How Do I Get the Fatwood Out? If you can get the stump out of the ground, you’ll have an easy time getting the fatwood. If you can’t, you’ll have to cut into the stump. Again, most of the fatwood is concentrated at the very top of the roots where they join the stump, with the largest concentration at the top of the tap root. 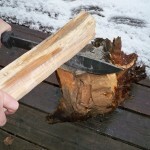 You can use an axe to split up the stump, but for more precision, use a hatchet or a large, sturdy knife (8″ blade or bigger), to “baton” off pieces of fatwood. In the pictures below, I’m using a Ka-Bar Cutlass Machete (I like the looks of the Ontario SP-8 Survival Machete even better for this job). Basically, you get a sturdy stick and pound the hatchet or knife down through the wood like a wedge, blade first (not point first) like this. You’ll want to have some wedges handy in case the blade gets stuck. This technique works great for regulating the thickness of the boards. 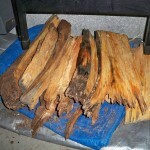 You’re wanting to split off fatwood planks about 1/2″ thick. You’ll know that you’ve reached the fatwood by the smell it gives off — the sweetest, strongest, pine scent you’ve ever experienced. It’s like walking through a Christmas-tree farm. That’s the resin. 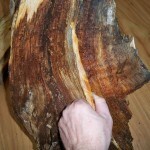 Be aware that the fatwood resin is very sticky. You’ll get resin all over your blade. So you might want to WD-40 it first. To clean the blade, de-greasers and gum removers work wonders. 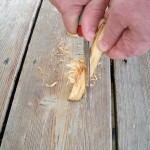 Once you’ve got 1/2″ planks of fatwood, you can split them into 1/2″ square sticks. 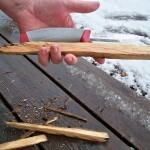 To get the sticks, it works great to baton through the fatwood planks with a smaller knife, as described above. Some folks like to use fatwood like a match. If that sounds like you, keep splitting it down to whatever size you’d like to use. If you give the sticks a pointy tip, they’ll be even easier to light. When you’re heading for the hills, just throw a 1/2″ stick of fatwood in your pack. A single stick of fatwood will produce enough shavings and small kindling to start quite a few fires. How Do I Use the Fatwood? You use the fatwood as your first stage when you build your fire — the tinder. The fatwood takes your spark or flame, then burns hot enough to get your pencil-sized kindling burning. Build up your fire from there. What you want to work with are fatwood shavings. You can shave them into a pile, or, as I prefer, make a feather stick. This is where you shave the wood but leave the shavings attached at the bottom of the fatwood stick. Then break off the feathered section and start your fire with it. If you’re going to light the fatwood with a spark (from a firesteel or magnesium rod), you’ll want the shavings to be as thin as possible. 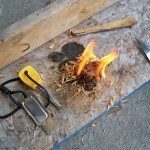 If you’re using a lighter, even thick shavings will take the flame nicely. Once the fatwood shavings take the flame, they’ll burn very hot. You won’t have any problem getting your dry kindling burning. Fatwood makes an excellent emergency fire starter. The fatwood’s resin waterproofs the wood, so even if the fatwood stick gets wet, the shavings still light up. Once lit, the fatwood’s flame resists getting blown out by the wind. Of course, if the wind is blowing, you’ll definitely want to use a feather stick of fatwood instead of shavings; nothing’s more frustrating than watching your shavings get scattered by a gust. In adverse conditions, you’ll also want to use some fatwood sticks as your small tinder, just to make sure you have a strong, hot flame that will resist the weather long enough to get your other tinder going. Anything Else I Need to Know about Fatwood? 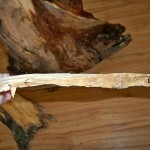 There are no special handling instructions for fatwood, and no special storage requirements. Fatwood keeps indefinitely, and a little bit of fatwood goes a long way. One good stump of fatwood can keep you supplied for life. So get out there and find yourself a stump. Fatwood is fun to harvest and easy to use, and with pine trees spanning all of the US, there’s no reason you can’t find a supply for yourself. 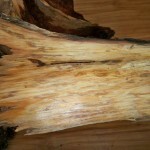 Fatwood makes an outstanding fire starter — almost miraculous. For foolproof, emergency fire starting, I think fatwood gets edged out by vaseline-empregnated cotton balls, but as far as natural fire starters go, fatwood is among the best nature has to offer.